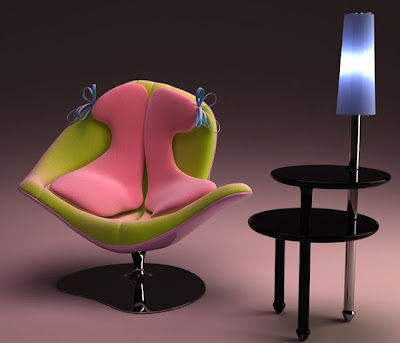 The name of this chair is Origine du Monde, Maybe! It's upholstered in memory foam and promises to provide a "near uterine sensuality." The Origine du Monde, Maybe! was designed by Italo Rota for Meritalia. I think it's safe to say that theirs is the first time such a promise was made by a piece of furniture. Maybe I'm not in the target market, but near uterine sensuality doesn't land real well over here. Whattya think? "near uterine sensuality" - I have my next post title, subject to be determined. Well it sure is ballsy. Or should I say ovarian? I gave birth to my first child in a room painted a colour I can only describe as 'womb pink'. It's the colour I see on that pair of cushions. So perhaps he's right about the uterine sensuality. Not that the sensations I had at the time were particularly comfortable. Maybe the chair contracts and grunts when you sit in it? Maybe when you try to get up out of the chair it starts to contract and it expels you from itself. No that's not NEAR uterine, that's just way too close to any uterine experience i want to have. Well I guess this chair is meant to be a safe spot where one can assume the fetal position. Whereas I think that chair's shape looks interesting for a good reading chair (I need somewhere I can sit for four hours or so while I devour my most recent literary discoveries).. I'm not so sure about the whole "uterine sensuality" thing. And the colour is BLECH. I don't think that I've ever known anyone to express the opinion that a uterus was "sensual".. that's rather creepy when you think about it. Maybe a poor translation? Chalking it up to a bad translation definitely makes it easier to accept. Good call. WHY DOES IT HAVE BOWS???!!!! The bows are what make it feminine. If they weren't there everyone would be confused and there would be rioting in the streets. Oh come on, you know you're dying to say something.